Large format digital production company Rocket Graphics has expanded its Watford-based facilities by adding 6,000 square feet to the Croxley Business Park site. This new space is now home to a new 3.2m EFI VUTEk LX3 UV LED hybrid printer. The printer was purchased from CMYUK, the UK’s largest independent supplier of wide-format digital printers, cutting equipment and materials. 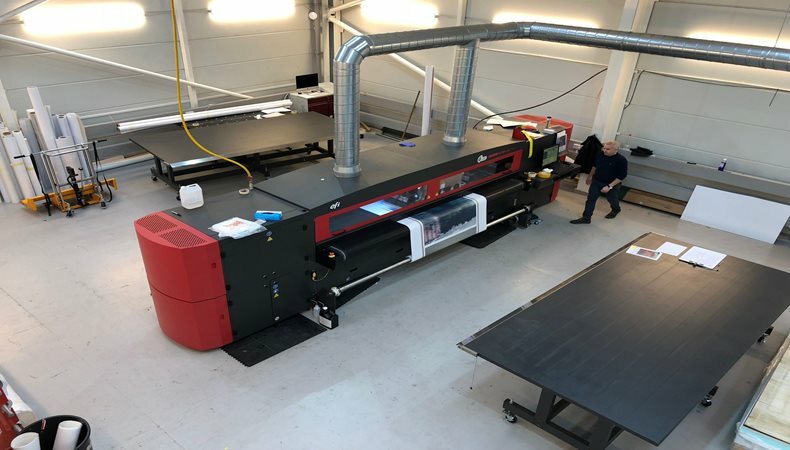 Rocket Graphics’ Sales Director, Anthony Rider commented: “The new VUTEk LX3 has significantly improved print quality and has provided us with a 400% increase in speed performance. Now we can offer our clients unrivalled white printing applications at much higher speeds and opacity. We can now deliver and install wall graphics measuring over 3,000m in a very quick turnaround time for the Ryder Cup, where colour quality and speed were of important." The EFI VUTEk LX3 is designed for high production throughput, resulting in shorter lead times to customers, while producing the ultimate image quality and with the versatility to support the widest range of materials and applications. CMYUK’s Group Director, Robin East said: “The 8 colours plus white printer configuration that features multilayer printing is a winning combination for Rocket Graphics who aim to offer the very latest applications and innovations to their customers”.